The Depot Community Room’s Fifth Annual River Heritage Day, held on Saturday, July 18, 2015 at Audubon Mill Park, featured a slate of activities for kids and adults, and included an evening dinner on the beautiful Henderson riverfront. Activities for every age group included bowfishing games, video duck shooting, fishing competitions, a dunk booth, toddler magnet fishing, exotic zoo animals, an interactive storytelling booth and a working lock and dam system. Rescue dive teams and vehicles, goose calls, duck blinds and bowfishing boats were displayed, and free boat safety checks were offered by the U.S. Coast Auxiliary. The evening fund-raising dinner was prepared by the Holy Name Men’s Club and was served by employees of Century Aluminum at the open-air OnDeck Riverside Bar and Grill located on Henderson’s beautiful downtown riverfront. 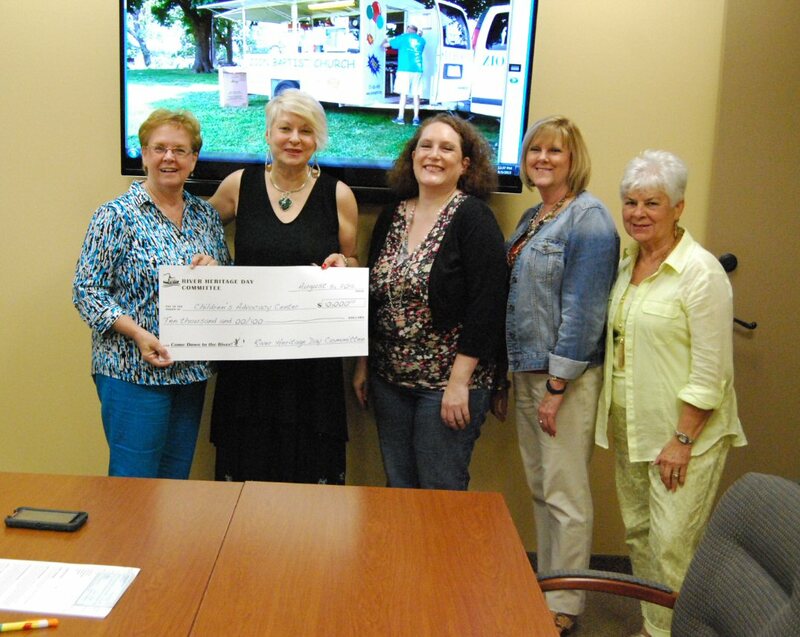 The Children’s Advocacy Center of Green River District received $10,000 from the proceeds of this event. The Center provides medical, legal, and psychological services to children who have been abused or neglected. They serve seven counties in western Kentucky. Corporate sponsors for this event were: Century Aluminum, Air Hydro Power, Stagg Farms, and TPG Marine/Green River Barge Service. Additional sponsors included: Henderson County Riverport Authority, Evansville Marine Service, LE2, Skinner Architectural Design, Methodist Hospital, Weaver, Dalton and Assoc., Big Rivers Electric Cooperative, Hunter Marine Sand & Gravel, Fryer Appraisal Service, Fryer Realty, Triple S Welding & Marine, Custom Resins, Field & Main Bank, Sonoco, Braco, Inc., Edward Jones/John Wilke, Riverview Coal, Airgas, and Independence Bank. The Depot Community Room serves as a repository for items of historical significance related to Henderson and Henderson County, and works closely with the Henderson County Historical and Genealogical Society to provide quality history-related exhibits and events. The Depot is open Monday through Friday from 10 am to 4 pm and Saturday from 10 am to 2 pm. For more information, call 270-830-9707.